There has been a lot of controversy in sports these days. Steroids, illegal recruiting,crooked referees and plain old cheating. It is a good thing that their is still a good honest and true sport around. 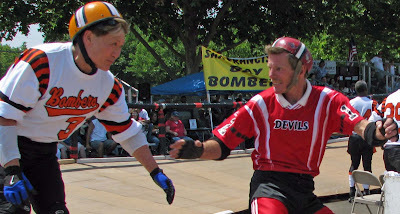 I am talking about Roller Derby. 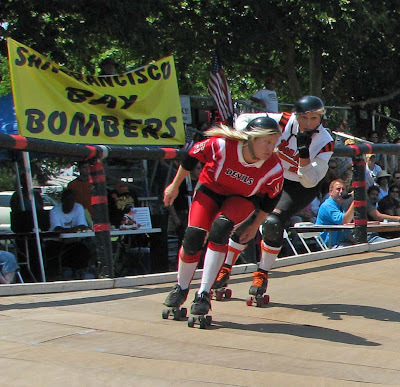 Roller Derby has been around for a long time. I have been a fan ever since I could turn on the T.V. I used to look forward to Saturday afternoons. It would come on right after another, true sport, wrestling. ("And Now Miss Wrestling Will Pin A Gold Star On the Winner!"). There were heroes like Charlie O'Connell and Joan Weston(The Blond Bomber). There were also villains like the purple haired Ann Cavello. She was the Queen of Mean! This was and is true entertainment. We were at the Alameda County Fair this weekend. They had an exhibition match. It was just like I remembered. 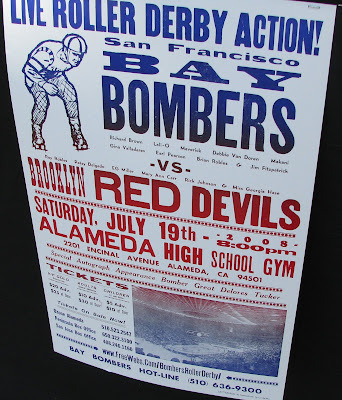 You have to cheer for the Bombers. Whoever plays against the Bombers rightfully needs to be booed and jeered. It can be a rough sport. These are true athletes. 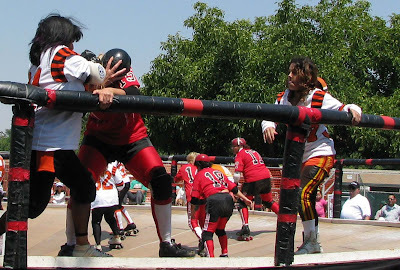 I have never understood why this sport has not been included in the Olympics. I am planning to attend one of the upcoming Bomber games. 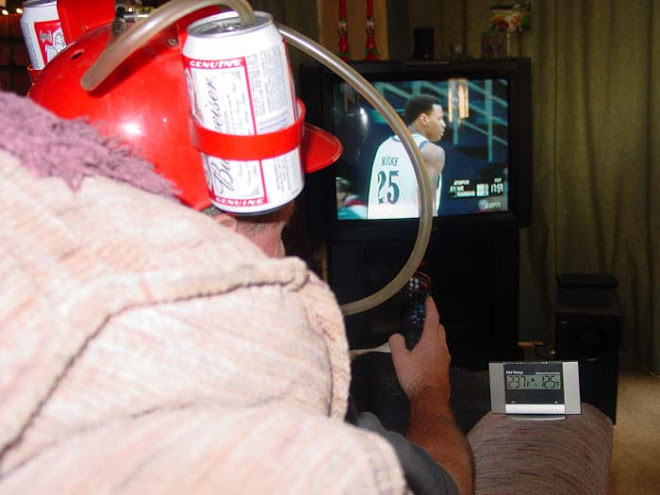 I know that I will not have to worry about any shenanigans that present professional sports have been producing. 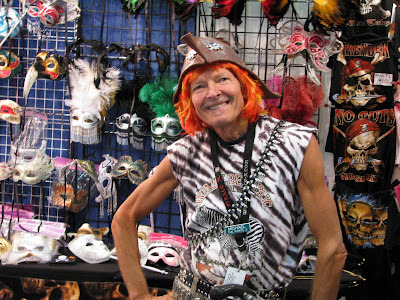 The Alameda County Fair is an old time, good time. There is something for everyone. There is the Midway to ride the carnival rides. You can win a stuffed bear for your Loved One. There is Cotton Candy and Corn Dogs. There was a booth barbecuing a monster cut of beef.What more do you need? The horse races are their to try your luck.There are pavilions to buy everything you always never needed. This is Old fashioned fun. Ms. Goofy and I packed up her new car. She received this as a stipend for reviewing some bacon a little while back. We drove to Pleasanton Ca. to check out the Alameda County Fair. 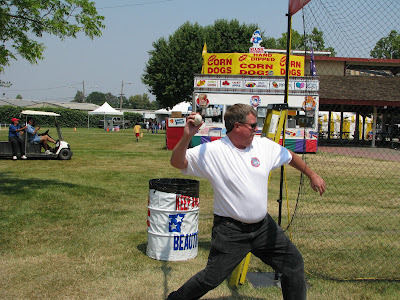 The fair dates are from June 20-July 6. They have all the usual suspects. 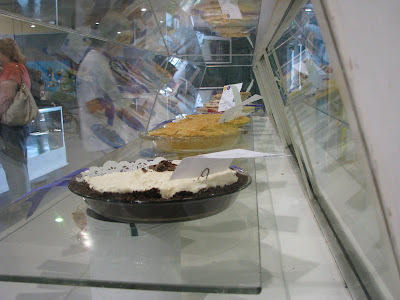 The livestock exhibits, 4-H, quilting, pie making, gardening, and horse racing. We found some events that really caught our eye. They had a tamale cooking contest today. We had to try some of course. They had a Roller Derby Match that was too much fun. (More, Later). We tried our luck by wagering at the horse race. Our horse came in second. The weather was perfect. The smoke has died down a little. I would guess the temperature was in the middle 80's. It was a good old fashioned day!!!! Break out the band. The first ripe produce has been harvested from the Chilebrown farm. It has been a long slow wait. I have a ton of tomatoes that have been teasing me. They are hiding in the green mode just waiting to burst out into a cornucopia of ripe color. These beauty's will make their way into a salad. You would not believe how many peppers I will have. I may have to set up a roadside pepper stand. I just have to be patient. Have you ever left a Barbeque catalog on the Coffee table or the Ice chest?. 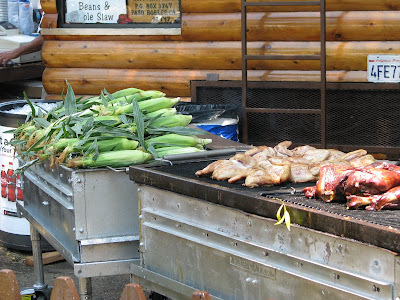 Have you ever told your wife that you are an "Iron Chef", and you need a new grill?. You leave the catalog on the table. The gift (barbeque) is circled and arrowed. You want to drop a hint. How do you do it? Well , I think the best hint to bring your" Beautiful Special Someone" Ms. Goofy, and show her the gift that will make her Man Happy! 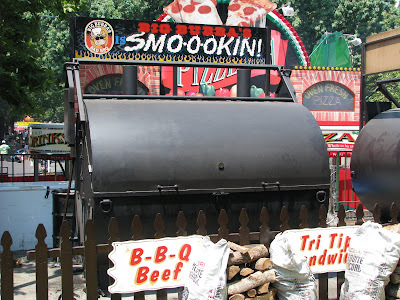 It is the George Jetson , Lost in Space, and 2008 barbeque. 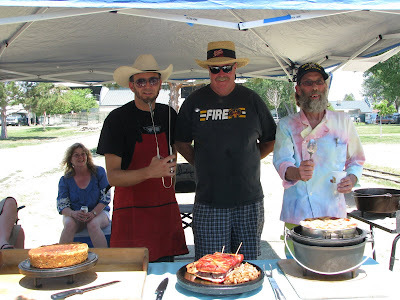 It is a custom barbeque that we happened upon at a festival in Martinez, Ca. I do not think I will get it for Christmas. I can only dream!!! It was a beautiful day. The thermometer was rising and I needed an excuse to fire up 4 cast iron pans in the kitchen. It was Bacon Friday. 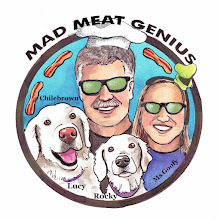 Today is the day that 3 expert bacon tasters are going to sample 4 different and unique bacons. These bacons represent different parts of the country. We have Scotts bacon from Kentucky, Nueske from Wisconsin, Butlers from Nevada, and Chilebrownacon from the homestead. Chilbrownacon makes this tasting special. It pits my creation against some heavy hitters. Let's meet the tasters. There is the Reverend Biggles in the House. 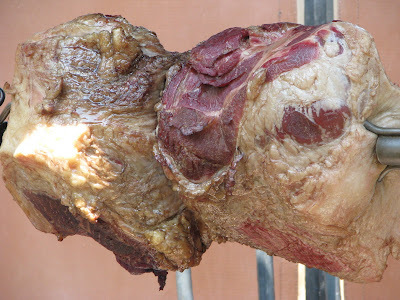 His expertise on everything about meat can be viewed at his tome Meathenge. The Reverend is a multi talented, gifted, and extremely rugged individual. He can come to your house and build a barbeque in the middle of your lawn with just his bare hands. He can smoke anything. His opinion is respected and trusted, besides, he owns a nice camera. Ms. Goofy's claim to fame is she has never met a Chicken Fried Steak that she has not liked. She is a beautiful women that just happens to be my wife. She is an expert at Meat Adventures and Bacon tastings. She is an expert at Italian cooking. I trust she will be fair and honest about the Chilebrownacon. Chilebrown is a self appointed ambassador of promotion to find the best bacon possible. I have been on a quest to find this Holy Grail of Bacon. We found it briefly at the A&B market in Bend Oregon. Sadly this butcher has retired. I have been searching all over the country for a new Gold Standard of bacon. I am looking forward to this tasting. Chilebrownacon is from my smoker in the backyard. Meaty was the consensus of the tasters. There was a good balance of smoke and sweet. Could this be the new Gold Standard of Bacon? It received high marks of 4.6 stars. Butler Gourmet Meats from Carson City Nevada was an unspectacular piece of bacon. It looked delicious but did not deliver. It received mediocre marks of 3 1/4 stars. Nueske from Wisconsin was the Smoke Bomb Deluxe. This is a quality bacon in all departments. Nueske may be the winner with a score of 4.5 stars. The results are in. The votes have been tallied. Chilebrownacon is victorious! It was a close race and Nueske and Chilebrownacon were tied for first. The tie was broken by a swing vote by Ms. Goofy. She loved the Meaty taste of the Chilebrownacon. Did I tell you about Ms. Goofy's new car. It is unfortunate that Chilebrownacon is in limited quantities. Nueske will be around for a while. This means that Nueske will be be the new Gold Standard of Bacon. The quest will continue and there will be future Bacon Fridays. Amen. Here comes the cream of the crop, banner, ace, first class, quality, tip top, superior, splendid, prime, divine, fabulous, out of this world bacon. It is my own creation. 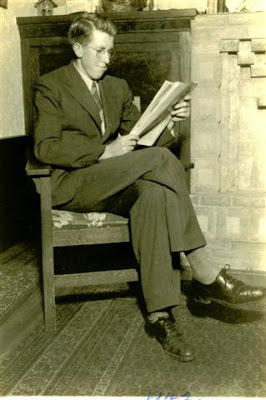 I have chronicled its birth in two previous articles. (Makin Bacon I, Making Bacon II). It is time to review my baby. I had an initial taste the first day it had been smoked. My first reaction was it was a little salty. It rested for a couple of days til Bacon Friday. I brought it to scrutiny by some true professional bacon tasters. I have included myself in this clan of three. I promise to be partial! The meat to fat ratio leans on the meaty side. I would like to say it is Meaty Beaty Big and Bouncy. The salt was pronounced but not overpowering. It had a sweetness that was subtle. Ms. Goofy claims it has a Meaty Ham taste!. It had just the right texture. It had a little chew, but not enough to tax your dentures. Overall it was almost a perfect bacon. Chilebrownacon will be awarded 4.6 stars out of 5. Butler Gourmet Meats is located in Carson City, Nevada. It is a clean and perky market located in a small strip mall. The slab has been cured with a maple sugar and hickory smoke. 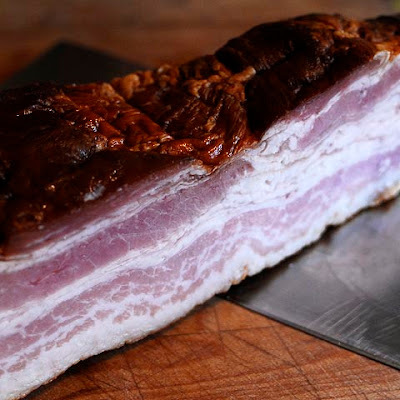 It is nitrate free.This bacon has a beautiful dark sheen surrounding the meat. I am not sure if it is from the cure or the smoke. If you could judge bacon just by its looks, this bacon would rate a 5. The meat to fat ratio is very good. This was the third bacon that we tried on Bacon Friday. 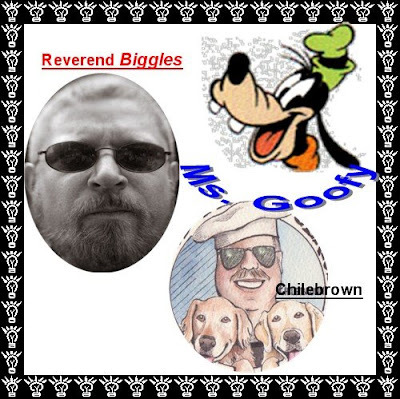 Bacon Friday was a tasting party that was attended by Reverend Biggles, Ms. Goofy and Myself. The first thing we noticed was the lack of smoke flavor. It was not very sweet. We did not notice any maple flavor. We did not detect a lot of salt. It is possible we had built up a tolerance from Scotts Country Bacon. The texture was chewy. Overall this was a very pleasant bacon. It did not have any standout qualities that we are searching for. Butler Gourmet Meats will recieve a 3 and 1/4 star rating. Welcome to the Bacon Revue. We will be entertained by a 15 time National Champion Scotts Hams. They won these awards for their hams. We will be reviewing the bacon of course. Scotts claim to make a wholesome product and not use any MSG, Nitrites, and or Nitrates. They are a small family run business located in Greenville Kentucky. The bacon has been rubbed with a special cure of salt and brown sugar. It is then smoked slowly with hickory chips. I found this company through a fellow bacon enthusiast, Heather, from 'Bacon Unwrapped'. I read about Scotts and had to give it a try. I ordered a slab online. A slight detail about the order grabbed my attention. Scotts claim that the bacon can be shipped without refrigeration. It does not have to be refrigerated until you receive your order. This seemed a little odd to me, but what the heck. It took 7 days by UPS to receive the order. It arrived in a thick card board box. I opened it right away. It smelled beautiful. It smelled like an old time smoke house from Kentucky. Their was no green fuzz or mushrooms growing from the slabs. I stuck it into the refrigerator for my piece of mind. The next step was to taste this 'Bluegrass State' smokehouse slab. 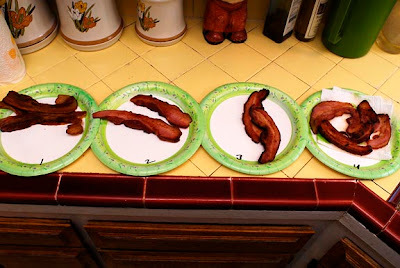 We organized a bacon tasting party for Friday. We invited the Reverend Biggles to attend. We promised him Kentucky bourbon and 4 different styles of bacon. He showed up with his camera and thirst for all things smoked. We did not have any bourbon so he settled for a Bud. 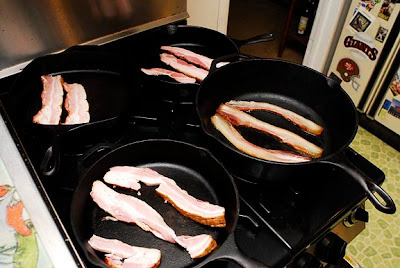 We fried all the bacon's in a cast iron skillets until crispy. The first bacon we tried was Scotts. The first thing that hits your palate when tasting Scotts Country Bacon is SALT. It is like biting into a salt lick. Biggles claimed it had an iodized salt taste. Ms. Goofy went straight to the water trough. Yes, it was salty. When you got past the initial shock, an 'Old Country Ham' flavor came through. It is a flavor us City folk are just not used to. It was chewy. Biggles proclaimed the texture was just wrong. Ms. Goofy just drank water. This bacon was not a bacon for the weak. It was a flavor and texture that people from California are not used to. I am going to award Scotts Bacon, two and one half stars. Here is a product that caught my eye at a local supermarket in Carson City Nevada. It is a Beef Tenderloin Filet. 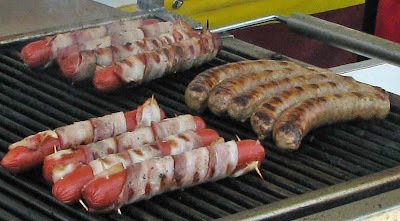 It is wrapped in bacon. It comes in a very convienent 6 ounce package. The best part about this little hunck of beef is it only cost $3.98. I have never heard of this Company Ledbetter. At 3.98 I picked up 4 for research purposes. I got it home and opened the package. It smelled fine. I added a little salt and pepper. I fired up a cast iron pan to a fairly high heat. I seared it on it sides to crisp up the bacon. I then place one side on the pan. I let it cook for aprox 4 minutes. I flipped it over and cooked for another 2 minutes. The total cooking time was close to 9 minutes. It came out a perfect Medium Rare. It tasted great! It was very tender. The bacon was not memoreable but good. I would definately buy these again. I was a little shocked at the price. Something just doesn't seem right. I tried searching for the Ledbetter company. I did not find out much. I then started to read the package. I think sometimes it is better to just not know. It contains 15 percent of a flavor enchancing solution. Sodium Lactate, beef flavor, salt, beef fat/powder, gelatin autolyzed yeast extract, sodium erythorbate, sodium nitrite, trisodium phosphate, maltodextrin and soy/wheat protein. I think a warning label should be posted "Don't Ask, Don't Tell". I needed to go on a Meat Adventure. It has been a while since the last one. I received a hot tip about some Basque Chorizo. The Tip was "Pete's Famous Basque Chorizo". Pete's is located at the 'Villa Basque Deli & Cafe' in Carson City. It just so happened that we would be staying the weekend in Carson. I did my homework and also found another Butcher called 'Butler Gourmet Meats'. We loaded up my truck, Black Bart, and went to the bank to get gas money. Off we go to Carson City. Butler Gourmet Meats is a clean and perky meat market. They smoke their bacon on the premise. They also make numerous sausages. Butlers has a lot of bulk meat deals. They have a Family Special for $69.95. It includes 1 pound of bacon,1 packages of pot roast, 4 packages ground chuck, 2 packages pork chops, 2 frying chickens, 2 packages of beef stew, and 2 packages of pork sausage. They have numerous other packages at all price points. We loaded up our ice chest with several sausages and 1/2 slab of bacon. Bacon Revue to follow later. I cannot wait to try them. Our next stop was Villa Basque Deli & Cafe for Pete's Famous Basque Chorizo. The Villa is located at the corner of a strip mall. It does not look very impressive from the outside. When you walk in the first thing you notice is a freezer full of Chorizo to go. They must do a good business selling sausage to go. I picked out a couple of packages and went to the counter to pay for them. It was lunch time and it was pretty busy. While I was waiting the waitresses were bringing plates of food by me to the tables. Wow O Wow did they look good. They called it Basque but it looked Mexican to me. Beautiful Mexican, that made my mouth salivitate. I levitated and slobbered in anticipation of trying some of this food. We would return for breakfast the following day. 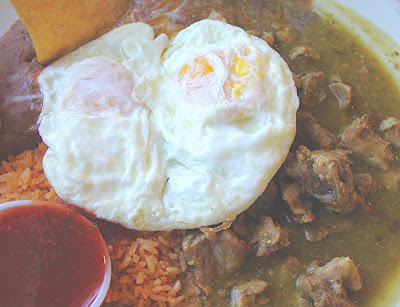 They had Chile Verde rice and beans with two eggs. This is dish that I could not refuse. We asked the waiter for a side of chorizo. He brought us a Chorizo sandwich cut in 4 to sample gratis. My dining partners had some great looking dishes. There was an omelete, chicken fried steak and some chorizo scramble thingy. This was one great meal. The Chorizo was very flavorful. I am glad I bought some to go. There is a reason it is Famous. The Villa only serves Lunch and Breakfast. If you are ever in Carson City, be sure to stop by. You will not be disappointed!! Welcome back to the Chilebrown smokehouse. We are continuing to Makin Bacon. The bellies have been curing for 8 days in the refrigerator. I have turned the packages over three times. The next step is to rinse some of the salt off. I took a large pan and added fresh water to rinse the bellies. I emptied and replaced the water 4 times over a 4 hour span. Take your bellies and dry off as well as you can. This is a crucial step. Place the bellies on a cookie sheet with a pan underneath. Place in the refrigerator and let sit overnight. Do not worry about contamination. They are already salted and cured. The reason for the overnight stay in the refrigerator is to remove all moisture. This way your future slabs will accept smoke. I am using Apple wood chunks in a Weber Rocky Mountain Smoker. I am using 2 inch blocks of Apple wood that I bought from E-Bay. I have thermometer in the belly and the smoke chamber. I am not messing around. I let it smoke for aprox. 4 hours at 200 degrees. The internal temperature of the bacon was 150. I let these beautiful pieces of pork love rest on a Cookiecrumb rack for two hours. I then wrapped them in foil and put them in the Chilebrown Ice Cave. Ms. Goofy and I had the initial slice. It was salty. I am a bacon FREAK! Ms. Goofy said it was perfect. I will take her opinion over mine. Bacon Revue will be following. Real Men do not like to go shopping. 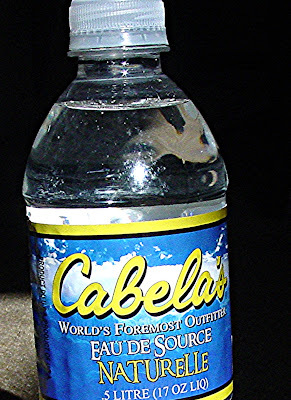 Real Men do not like to go shopping unless it is Cabela's. 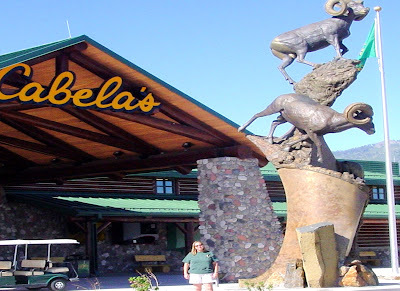 Ms. Goofy and I were driving back from Reno when we spotted Cabela's. It is hard to miss. It is located next to the Boom Town Casino in Nevada. It is large. It is larger than large. There is RV and truck parking. There actually is a small shuttle. Things are looking good. We walked through the magical doors. There is a greeter who asked us if this is our first visit. We acknowledge that it was our first time to Mecca. He gave us a map and wished us well on our journey. He said he would see us in a couple of hours. The store is divided into categories of outdoor activities. Where should we start? There is camping, hunting, marine, fishing, etc. They even have a shooting gallery. You don't actually get to shoot a real gun. It is an arcade style gallery. I had to pry Ms. Goofy away from the shooting gallery so we could shop. We just started to walk in a counter clockwise direction. I did not want to miss anything. There was a department set up just for Dutch Oven's and accessories. I have found my spot. They had everything I did not need and more. There was a display of stuffed wild animals. Maybe it was for inspiration of what to cook in the Dutch Ovens. 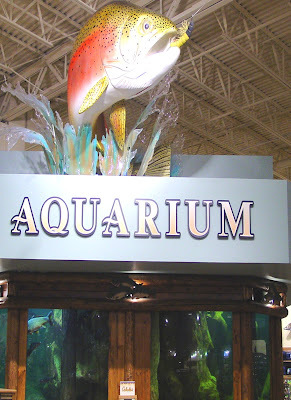 There was an aquarium with real live actual fish. I guess it was just to tease people like me that cannot catch any fish. There is a restaurant to refuel to keep shopping. We did spend a little while wandering around in awe. I finally picked my purchase and proceeded to the check out counter. (Picture below). I never dreamed that I would have fun shopping. First Place, It has a nice sound to it. Every time I say First Place my head begins to swell a little more. 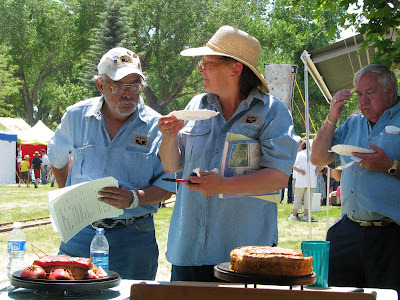 We have just returned from the Rendezvous Festival in Carson City. Yours Truly took two First Places. I won First Place in the category of Bread by the Judges. I also nailed the People's Choice Award for Bread. Our Team the 'Meatmen' took First Place in the People's Choice Award for our Main Dish. We took Second place overall in the competition by the Judges It was a good weekend. The weather was in the mid-eighties. The crowd was plentiful. The food and companionship was spectacular. I woke up this morning and looked at the front page of the local newspaper. There we were. 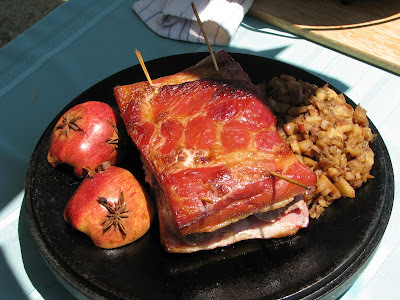 There was a picture of Abram with his Pork Roast. All the awards were listed. We were local celebrity's. I won a nice plaque and a nice little wad of Cash. The Cash almost paid for gas. (to Reno). Our team won a plaque, some books and a gift certificate to the local market. We promptly cashed that in. It is a couple days early, but I wanted to get this in. My Father has been gone for several years now. I think about him all the time. He made an impression in my life. He was a giving and caring man. He sacrificed everything for his children. He lived the American Dream. I would like to think I am following in his footsteps. My Dad planted the gardening bug in me. He would drag me into the garden as a kid. Now I really enjoy the garden. 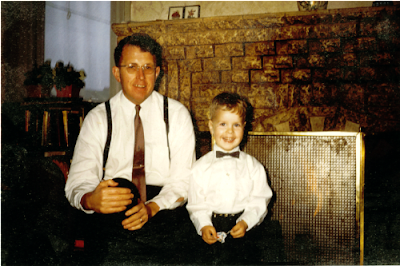 Fathers Day is a day to tell your dad you love him. I will remember him as a great Man. Dad I miss you and I love you! Happy Father's Day! Milk-Bone dog biscuits just celebrated their 100th birthday. Mojo and Oscar are very excited about this milestone. These canine treats were created in New York and were originally called Maltoids. The name was eventually changed to Milk-Bone because of the cow's milk it once contained. Whatever it contains the boy's love them. 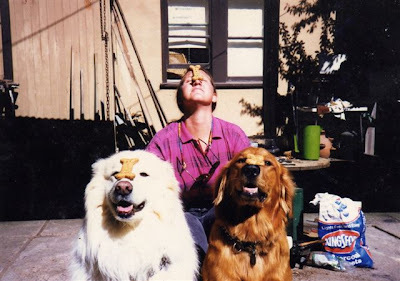 A dog biscuit to them ,is like bacon to me. Hey how about a bacon dog biscuit? Mix ingredients . Put heaping tablespoonfuls onto a greased baking sheet. Bake in a 350 oven for 15 minutes. Turn off oven and leave cookies on baking sheet in the oven overnight to dry out. Milk-Bone has a van that is traveling the country. They are celebrating and promoting the Centennial celebration. They will be at the Alameda County Fair, July 3-6. The fair does not allow dogs. Mojo & Oscar are disappointed. 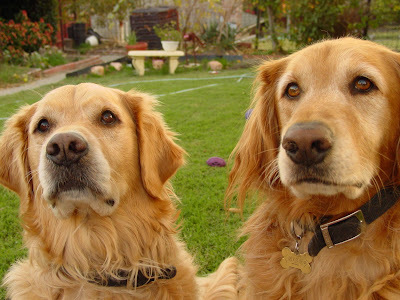 They will be happy when I make them some Bacon Dog Biscuits. That is, if, I do not eat them all first. * There is a Free Shipping Offer from Nueske till July 1. Yeah!! Do you recognize any of these tools? They are specialized tools for a specific form of cooking. They are simple in design, but high tech in performance. I will give you one more hint. 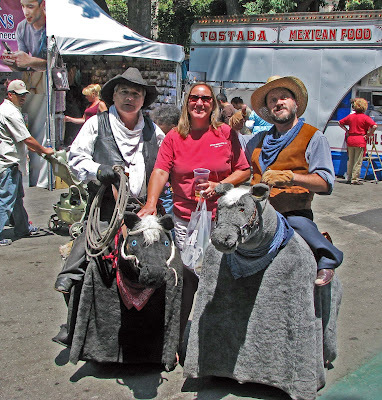 They will be used this weekend at the Rendezvous festival in Carson City, Nevada. If you guessed they are tools for cast iron pot cooking, your correct. These are Pot lifters. They are used to lift the lid off the cast iron pot. The lid will have live coals on top. You can imagine how hot it gets. These lifters are invaluable to save your hide. The X looking tool is a trivet. It is used to place the pot lid on while you are stirring or serving. All these tool will be put it to use as our team the 'MEATMEN" competes in a 'Three Pot Cook off"
A Three Pot Cook off consist of three dishes cooked in cast iron pots. The first dish is usually a bread. This is my specialty. 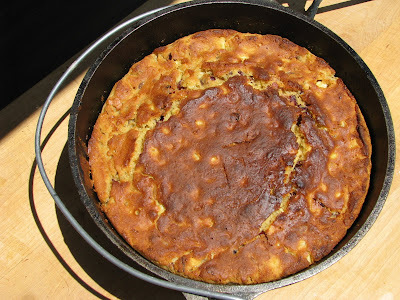 I am making Maple, Cranberry and Bacon Corn Bread. The second dish is the Main. Abram will be making a pork loin roast. The third pot is a dessert. 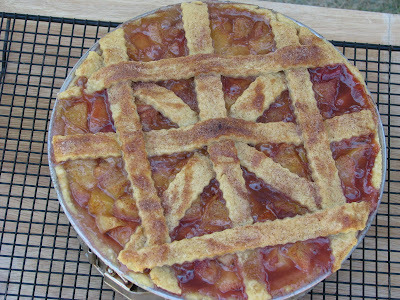 Larry will be making a peach pie. We will have approximately three hours to complete these dishes. Everything has to be prepared on the site. All the dishes have to be cooked in cast iron pots heated by charcoal. They will be judged and scored individually. The scores will be combined and entered as a team score. The judges look for several things. Presentation: The presentation is pretty simple. Does it look good? All the dishes can be only served on the pot or lid. Taste: This is an important category. Great looking food does not always taste good. Temperature: Is the food done? Is the dish burnt or underdone? I am looking forward to this weekend. The festival sounds like a lot of fun. I do have some pre-competition jitters. This will all end once everything is set up and we are cooking. Hopefully we will come back victorious.